This is an original large 10"x 14" black and white photo (fading to grey)of a Cowboy with a gun in hand. The Smith & Wesson Model 1 and 1/2 gun is also available information is under Antique pre- 1898 revolvers on this site. The picture is beginning to deteriorate around outside edges. Revolver not included, only the photo. This is an original large 10"x 14" black and white photo (fading to grey)of a Cowboy with a gun in hand. 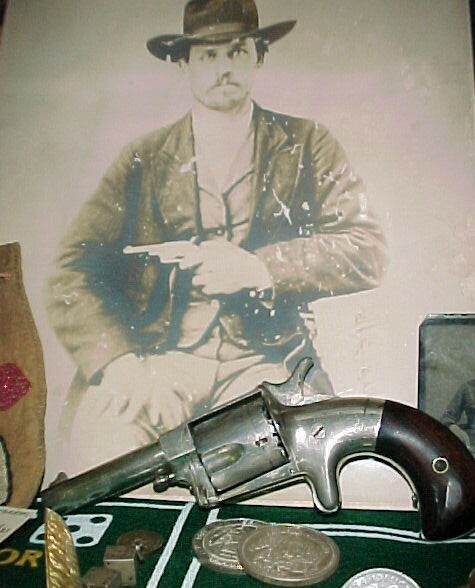 The Smith & Wesson Model 1 and 1/2 gun is also available information is under Antique pre- 1898 revolvers on this site. The picture is beginning to deteriorate around outside edges. Revolver not included, only the photo. Please email cowboycabin@centurytel.net with questions or call 406 270-2842.